$1 Shipping Sale Ends June 10 at The California Wine Club! It's been hardly a decade since the long-maligned metal screw cap started appearing on quality wines, and during that short time, many wine enthusiasts have moved from snobbish rejection to closer analysis and on, for many, to enthusiastic acceptance of a wine bottle closure that cannot impart cork "taint." Now get ready for the next big thing: With consumers, manufacturers and governments world-wide looking much more closely at the "carbon footprint" of consumer goods in an age of environmental concerns and rising fuel costs, the glass wine bottle is coming under critical scrutiny. "Glass is one of the heavier packaging materials, which has made wineries investigate alternatives," reporter Jo Burzynska wrote last month in The New Zealand Herald. Just as wine makers Down Under were first to embrace alternative closures, this same region - around the world from export markets in North America and Europe - may take the lead in ditching glass in favor of lightweight wine containers. "Australian winery Wolf Blass has just released part of its range in plastic bottles in its local market, which it claims are 90 per cent lighter than standard glass and able to keep wine in good condition for a year due to new technology," Burzynska wrote. She added, however, that the relatively short shelf life of wine in plastic bottles rules it out for wine worth aging. The same is true, and more so, for the lightest-weight and perhaps most environmentally friendly package, the bag-in-box. Although widely sold Down Under (there nicknamed "cask" wines), the box is not unfamiliar in the U.S. but had heretofore been largely limited to inexpensive mass-produced wines at a quality level that few wine "geeks" admire. "While [bag in box is] not currently suited to long-term storage," the New Zealand reporter went on, "perhaps more of a stumbling block is the stigma associated with imbibing from the bladder that's made many steer clear of putting premium products into Château Cardboard." Indeed. As a practical matter, while the bag-in-box technology will keep wine nicely in the fridge for one or two months, it's simply not a format for pricey, cellarworthy wines. But with one carboard box and plastic insert replacing four hefty glass bottles, its environmental advantages - and cost benefits - look mighty tempting to the makers of drink-me-now wines. In an apparent effort to reach upward from traditional box-wine drinkers to a more sophisticated market, a number of producers have begun putting wines of better quality in the box format. Over the past couple of months, I've tried a couple that I can recommend without qualms for everyday table use. * Bota Box, a California red wine distributed by Delicato Family Vineyards, is heavily marketed with tree-hugging language. From a public-relations release last autumn, Bota Box received an "extreme green makeover with a new look. ... a new package that is more environmentally-friendly from a container that is made with 95 percent post-consumer fiber and the box is recyclable. The print on the package is now done on unbleached kraft paper and the ink used is water-based versus petroleum-based and the paper layers are held together with cornstarch instead of glue." Whatever. It sells for $15 to $20 for a three-liter box (four standard bottles) in a half-dozen grape varieties. Best of all, I tasted the Shiraz at several church dinners and found it surprisingly drinkable, maybe a cut above the "fighting varietal" class of bottled wines. It was a dry, properly acidic table red, neither sweet nor soft and made to go with food. Click for the Bota Box Website; or use this link to find vendors through Wine-searcher.com. * Red Truck, a decent budget-level wine that's been sold in standard bottles in the under-$10 range for several years, recently, er, rolled out in a bag-in-box format designed to look like a little faux wooden barrel that invariably gets "oohs" and "aahs" and "Oh, so cute!" when you put it on the table. Red Truck 2007 California Red Wine is more than palatable: A blend of Syrah, Petite Sirah, Cabernet Franc, Malbec and Mourvedre, it's dry, acidic and showing a distinctly astringent tannic edge, it's not at all the soft, sweet plonk that you might expect from bag-in-box. The 3-liter box, er barrel, sells for $29.99 at the winery and generally a few dollars less at wine shops. Here's the Red Truck mini-barrel Web page. 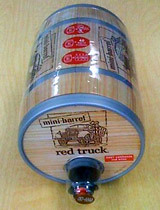 The following link will show you vendors and prices for the Red Truck mini-barrel on Wine-searcher.com. Tired of hearing about the ailing economy, bankrupt companies and government bailouts? Ready for some good news? The California Wine Club's $1 Shipping Sale is going on now, take advantage of these Recession Buster Savings and stock up for summer. Visit www.cawineclub.com and click on the $1 Shipping Sale button, or call 1-800-777-4443. When you order a half or full case of your favorite, limited-production, award-winning wines, you'll receive the shipping for just $1. In addition to paying just $1 for shipping, you'll also receive our winery-direct savings and save up to 50 percent off normal retail prices. Since 1990 The California Wine Club has featured California's best "mom & pop" wineries, introducing wine lovers to limited-production, award-winning wine that can't be found in local stores.